Clearly Art Glassware - Etc. - Find. Eat. Drink. Renato Cantoni’s recommendations for restaurants in Montreal. If you are the type of person who needs all elements of your life to be structured, standardized, and conforming, then this is not the glassware for you. For Renato Cantoni, founder of Clearly Art, standardization is the enemy. He loves that while each handblown crystal glass is made with craftsmanship and precision, no two glasses are the same. This is the nature of the process. It doesn’t mean that Renato designs glassware without purpose or function. In fact, quite the opposite - as an avid wine and whisky lover, he is driven by both, but he designs in a way that aesthetically please his creative bent. The Brunello Technico glass is an example of the marriage of form and function. Designed as a decanter in a glass, it features “an inward asymmetrical indentation” that acts as an obstacle in the wine swirling process to optimize the aeration process. That’s the technical description, but the reality is that the eye focuses on the interesting shape anomaly and it really makes the wine aromas sing in the glass. It’s handmade by artisans of Amofo di Cambio, in Tuscany and has been designated the official tasting glass of the Consorzio del vino del Brunello di Montalcino. Renato exited his positions as president of Pirelli Canada (the tire company), and as Vice President of Price Club, to pursue his passion designing glassware. Since then, he has designed 6 collections, 30 different glasses, and 20 decanters, always focusing on the purpose of the glass while striving to enhance the creative design. He admits that in reality, if you maintain some level of the traditional shapes of the wine glass, there are only so many creative changes you can make. This hasn’t stopped his passion to continually evolve and create glassware. His latest creation is the Roulette Whisky Tumblers, which are hand made in Germany. 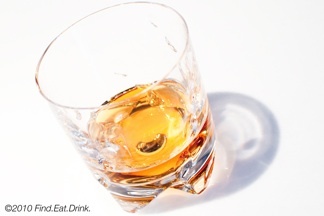 It is so perfectly balanced that it spins on its axis “like a roulette wheel does on the casino’s playing table.” Scotch whisky purists who vow that ice should not be anywhere near a single malt will cringe a tad, but the spinning of the glass produces additional friction to melt the ice. The purpose of the glass is, again, one of both form and function. It’s furthering enjoyment to multiple senses. You drink from an aesthetically pleasing glass, enable the extraction of aromas, enhance the ice melting process to produce different flavor profiles, and are visually stimulated by the spinning action. In other words, you get to be a kid playing with your adult beverage. In addition to Renato’s designs, Clearly Art carries glasses from famous Twentieth Century designers like Joe Colombo, Marco Zanuso, and Cini Boeri, who has a cult following, since her glasses were used in the Harrison Ford movie Blade Runner. As with many of the chefs, purveyors, and creators we talk to, Renato’s passion for his products is addictive. But to stand the test of time, the resulting creations must also be unique and authentic. In this day and age of big box stores, Renato’s passion against standardization is a breathe of fresh air. His glassware is both beautiful and highly functional. Designed with uniqueness and elegance in mind, but also a sense of history and function. Each hand made piece of glassware may be individual and different. Video of the spinning Roulette Whisky Tumbler. Copyright ©2010 Find.Eat.Drink. All rights reserved.